While we were away on holiday in the US, the weather in the part of England where we live was very warm, but there was also lots of rain. As a result, my vegetable garden pretty much exploded. It was wonderful to come home to great big zucchini, tomatoes, peas and beans. I’ve been thoroughly enjoying cooking with the fruits of what seems to be very little labour indeed. My carrots were not quite so successful however. I know that vegetables are often a bit mis-shapen, but mine were very small indeed with so many extra ends on them they looked more like extra-terrestrial creatures than garden produce. And after a few days I realised that if I wanted to keep harvesting fresh produce, I was probably going to have to turn some of my other crops around. So I ordered another batch of plug plants and set to tidying up the vegetable garden a bit. I’m quite pleased with how its all looking now. I’m particularly pleased with the herbs in front and the corn, which actually has several small ears forming on it. I used to grow corn with my Dad when I was a little girl in Canada. I have very fond memories of gardening with him, and most of what I know about vegetable gardening comes from him. 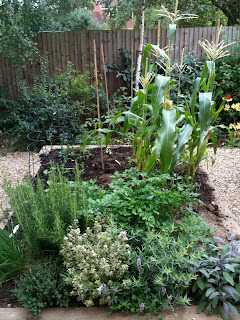 I’ve underplanted the corn with Mizuna, a leaf which is sometimes used in salads, but most often in Eastern cooking. I’ve never even tasted it before! I’m also growing some spinach and Rainbow Chard, alongside another crop of peas, French beans and some more tomato plants. They’ve gone absolutely crazy and have grown all over the edges of the raised bed. I’m getting gorgeous sweet cherry tomatoes from them daily, and look at these! There are tons of them just like that all over the plants - I can’t wait till they ripen! Anyway, the purpose of all this is definitely not to brag, because I’m no gardener - most of what has happened here is more luck than judgement. But what I am hoping to do is to encourage everyone to grow something for themselves this year, even if it is nothing more than a bit of lettuce or some strawberries in a pot like this. If I can do this, anyone can!! You can even grow things in pots on your windowsill. It’s just so lovely to be able to pick something absolutely fresh and cook it or use it in a salad. And if you have children, it’s a wonderful way to show them exactly where their food comes from and how it grows. It’s economical too - I have not had to buy any vegetables at all this week except eggplant and red and yellow peppers. Only trouble is, the rain made all the weeds in my flower gardens grow too, and I still have not even finished planting all of the flower gardens up. So I’m going to have to tackle those next and get some more plants in soon, before the weeds take over!! What a wonderful garden and everything is growing so well. I love your raised beds, what a great way to rotate your crops.